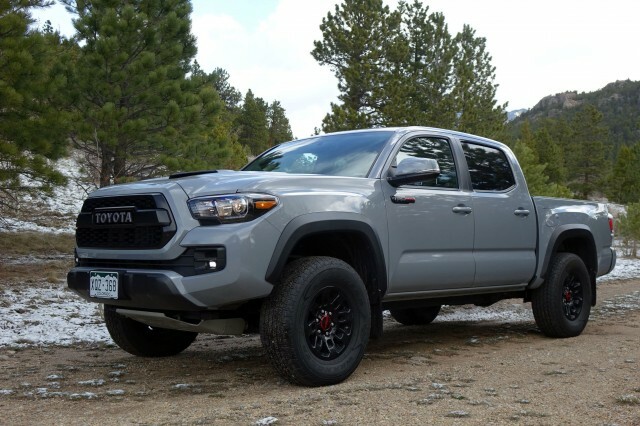 The Toyota Tacoma’s “just right” recipe has long made it a leader among smaller (but still rather large) pickups, and this year the most capable out-of-the-box Taco TRD Pro offers an even more compelling reason to get dirty. It’s sort of a “Raptor Lite,” an off-road-ready pickup built up to save owners the hassle of aftermarket upgrades. Like the Raptor, the Tacoma TRD Pro is the lineup’s flagship, except it lacks the Raptor’s power and it’s not as much a dedicated dune-basher as it is an all-rounder ready to conquer just about anything. Its advantage lies in its smaller footprint, which, although large, is definitely not Raptor big. The Tacoma can squeeze in where the Raptor cannot, and it is far more useful on a tight trail. For now, it’s arguably the most capable off-road truck on the market, at least when the trail tightens. However, the upcoming Chevrolet Colorado ZR2 certainly piques our interest. Here’s a look at what we found after driving through the river, over the woods, and even around town in a $45,087 example optioned up with $1,100 in somewhat dubious options like a first aid kit ($30), a tablet holder ($99), wheel locks ($80), and mudflaps ($129). In terms of off-road tech, Toyota didn’t leave much untouched. Starting with the already capable TRD Off Road with its high-riding suspension, two-speed transfer case, multi-mode traction control system, Crawl Control that makes the truck lope along at walking speeds, and locking rear differential, the TRD Pro adds Goodyear Wrangler All-Terrain Adventure tires with hefty sidewalls, a beefier skid plate to protect the front differential, a one-inch lift kit, Fox internal bypass shocks, and a rumbling sports exhaust system. Toyota even adds some styling bolt-ons that work well, like Rigid Industries LED fog lamps, black powder-coated alloy wheels, and a grille with big TOYOTA badging that’s reminiscent of the brand’s vintage Land Cruisers. Oh, and there are two GoPro mounts so you can record your off-road journey and post it to YouTube for nine people to view. Hey, you never know, maybe you’ll get lucky and millions will watch you testing out the traction control system to dig yourself out of a dune. … but there’s still a lot that’s missing for the money. You’d think that $45,000 would get you a height-adjustable driver’s seat (shocker: no Tacoma offers one) or a booming stereo (a JBL system is optional on other Tacomas, but not here). The seats are upholstered in a nifty stamped leather that, frankly, feels more like vinyl than real hide. Sure, it’s an off-road truck, but it’s still an expensive one and these seem like oversights that would bat an eyebrow at $10,000 less. The basic Tacoma crew cab with four-wheel drive will get four people and their gear just about anywhere, but the TRD Pro does so with more civility. Its Fox shocks smother harsh impacts, which lets drivers dial things up to 11. It’s a confidence-inspiring package that had us tackling some more challenging trails at a considerably more aggressive pace than we might have in a different vehicle. Apple To Launch Cross-Platform iOS And macOS Apps Next Year? Mazda names chief marketing officer for U.S.